Well have we got a treat for you today. 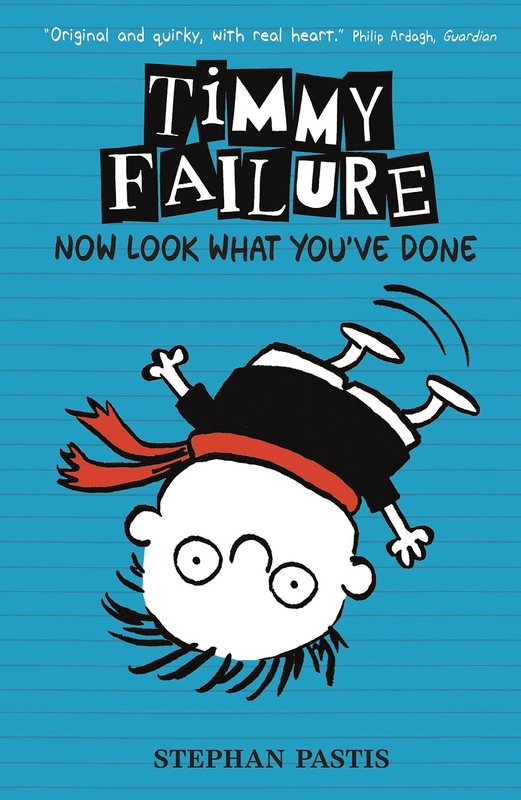 If you've got kids who love to read, this set of Timmy Failure books will keep them very happy. And we have a set for you to win by completing the rafflecopter widget. But first, here's what 11 year old J thinks of Timmy Failure. We were sent books 1 and 2 so J has written a little review for each. Timmy runs a detective agency with his pet polar bear called Total. He has a lot of cases to solve and he uses his mother's Segway as his failuremobile. He leaves it outside whilst talking about an important case but it gets stolen! Timmy lies and says that it is needed for a play. Timmy has to try to get it back before his mum finds out that her Segway is missing. Total has to be sent to a zoo as a result of bad grades. I give this book 10 out of 10. This book is hot off the press as it has only recently been released. Timmy is trying to win a detective contest where you have to find out who took the missing globe. With Total, his polar bear, he is determined to win the contest. Unfortunately, Corrina Corrina (his arch-enemy) has entered the contest as well. Total gets distracted a lot and tries to eat torpedo Bob (his aunt's parrot.) After he misses the deadline he tries to get sent to Glouberman academy- the school for naughty kids. Glouberman academy have their deadline a month after every other school so he wants to hand in his entry there. The winner will be announced at a school dance. The theme is a night in Paris. Thanks J for the reviews. Both my boys really enjoyed these books. They are a fun read and there are plenty of cool illustrations throughout. 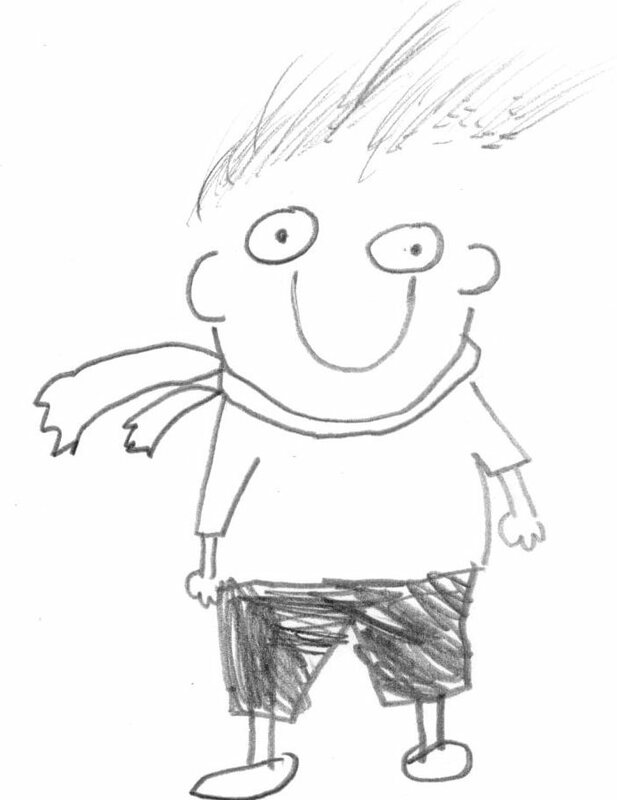 He'd drawn his own picture of Timmy Failure. 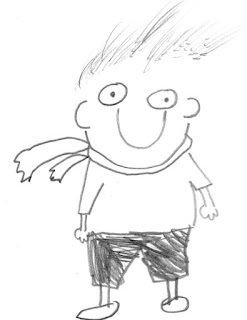 I had a quick flick through the book myself and saw that there is a 'How to Draw Timmy Step-by-Step' section at the back of the book. You can also learn how to draw Total, his Polar Bear. I thought this really was a great little touch to the book as it's going to give kids the confidence to have a go at drawing and actually end up with pretty great results! Anyway, let's get onto the very exciting matter of the GIVEAWAY! YAY! You can enter to win a set of 3 Timmy Failure books by completing the rafflecopter widget. Entries will be checked. This giveaway is open to UK residents over the age of 18. For full T&C's please see the T&C's detailed in the rafflecopter widget. And if you aren't lucky enough to win this time, you can get hold of your own copy from Amazon here. It's received rave reviews and seems to be an extremely popular book for kids. Disclosure: We were sent books 1 and 2 for the purposes of review. All opinions are our own. The publishers are providing a set of 3 Timmy Failure books to 1 winner. This will be sent out directly from the publishers or their agents. I'm already an ambassador for Pink Lining. Why? Because since I've had my Pink Lining Yummy Mummy changing bag, it has come everywhere with me and I've told everyone about it. Friends have 'oohed' and 'aahed' over how lovely it is. Strangers thinking about buying a Pink Lining bag have asked to peek inside to help them decide. Pregnant mums expecting their first child have asked questions about how many bottles and nappies would fit in. I let them feel the quality of it. I show them all the pockets inside. I explain that it holds plenty of bottles and oodles of nappies. I tell them how it has changed my life. Judging by how impressed they were, I'm pretty confident several of those people have gone onto buy a Pink Lining bag. So in many ways, I believe I already am and always will be an ambassador for the Pink Lining brand. But I would LOVE to make it official. Pink Lining are searching for blogger ambassadors to work with and if there was one brand that I would love to work with more than any other it would be...you guessed it..Pink Lining. As well as the quality, longevity and practicality that their products offer, they simply ooze style too with their distinctive prints and designs. I love how the brand has grown and added to its product range. Now it's not just me who has a Pink Lining bag in our family, but little Miss T has a gorgeous Pink Lining satchel from the Pink Lining Child range (and you will get to hear from her later on). You can also get Pink Lining Holdalls, washbags, wallets, Tote bags, rucksacks and even phone covers. The Pink Lining child range also has some fabulous lunch boxes and wheelie cases. And this is just a few of the items I've mentioned from the Pink Lining brand. There are too many wonderful things to mention them all. But a quick look around their website will leave you wanting almost everything!!! So Pink Lining is a brand not just for new mums needing a changing bag but for families with different and changing needs and I feel like Pink Lining has been there alongside us on our journey as parents. 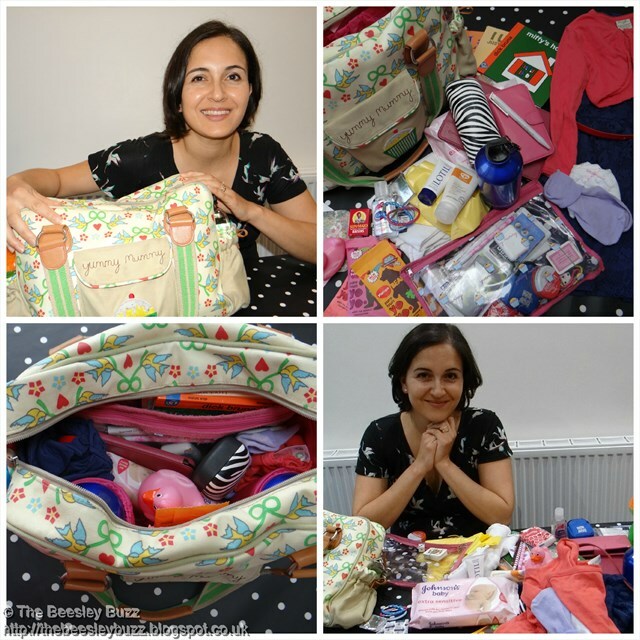 Owning a 'Yummy Mummy' bag helped me begin to believe that I could start to feel like a yummy mummy rather than feeling overweight with the extra baby weight I was carrying, frumpy as I had no time to buy myself any new clothes, and generally a mess as I seemed to have no time to look after myself when my baby was born. Everytime I went out with my Yummy Mummy changing bag, I started to walk a little taller and started to feel better about myself. All this fits into my Pink Lining Yummy Mummy bag! Pink Lining want us to share what we carry in our bags and whilst we normally keep our videos short and snappy, this has unintentionally become a rather long video but that really goes to show just how much can fit in a Pink Lining bag. If the video is too long, then I'm just going to urge you to watch near the end where there is a bit of a tip about how I use the 'wets' bag that came with my Pink Lining bag along with a couple of more unusual items I keep in there (dice and a pack of playing cards). As it is clear I can see through it when I'm looking for something and can find it at a glance. And as I'm not the only one with a Pink Lining bag in the family, Miss T was keen to show what she keeps in her bag. So if you want a shorter video to watch, with someone cuter, here is Miss T showing what's in her Pink Lining bag. 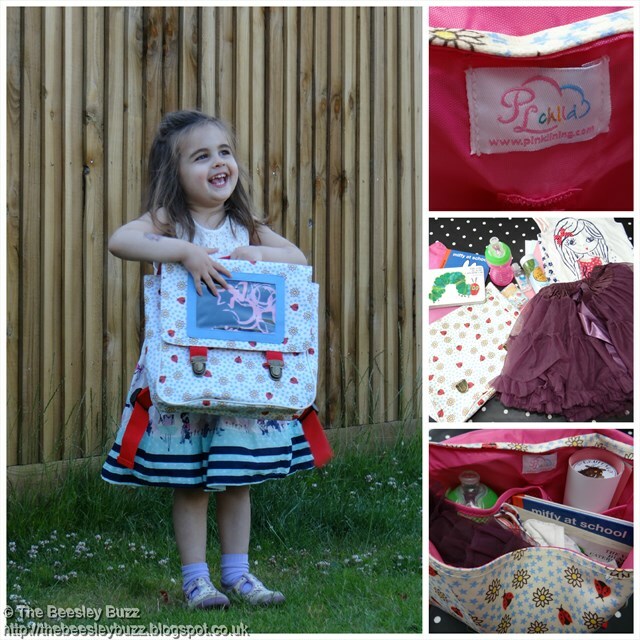 Her satchel has proved so useful for visits to granny, play dates and the hospital visits that she is having all too frequently because of her juvenile arthritis. And even the Pink Lining Child range can fit soo much in. Just look at her stunning Poppy England tutu that fitted in there along with all her other things! We love the clever design on the children's satchels where you can showcase your little one's drawings in the clear section on the opening flap. Miss T is currently proudly displaying a painting she did by printing pink shapes onto black paper at preschool. We love baking and making, children's story books and having adventures of our own. We blog about our holidays and family times, and the ups and downs of life (but mainly the ups). We love working with brands that we adore and are passionate about on a longer term basis so that we get to know the brand better and they get to know us better. So Pink Lining, we love you and always will and we really really hope that you will love our blog too. This is my entry into the Pink Lining Ambassador search. You can find out more about Pink Lining here. For this month's siblings photo, I managed to get a snap of them all together at this year's Open Farm Sunday earlier in the month. We always try to get to a farm for Open Farm Sunday as it's such an educational and fun day out. And as June is J's birthday month, I took the opportunity to grab a couple of pics of the three of them whilst J blew out his candles. When the lovely people at Macmillan Children's books heard that Miss T had been having a rough time lately with her juvenile arthritis, they kindly sent her a few books to cheer her up. As we LOVE Julia Donaldson's famous rhyming books, we turned to this one first. It's called 'What the Jackdaw saw' and I have to admit being rather puzzled by the first few pages. As the Jackdaw flies around to invite various animals to his party, he finds them touching their heads. Very bizarre I thought - as did the Jackdaw it seems. Until finally we find out just what they were trying to tell him. It's a fun one to re-read once you know the secret as there is a big clue in the illustrations with the storm cloud getting closer and closer and bigger and bigger. Finally the Jackdaw 'gets' it with the help of a wise owl and manages to invite lots of friends to his party. As well as the very clever storyline - which has been written not just by the talented Julia Donaldson but also with the help of deaf children in association with the non-profit organisation Life & Deaf. It's illustrated by another very talented person, Nick Sharratt, who we know from many other fabulous children's books. The author's proceeds from this book will go to The Life & Deaf Association. So what better reason to get a copy...enjoy a great story, learn a little BSL and get to help a brilliant cause all at the same time. The book has an audio CD to accompany it where the audio story is read by (one of Miss T's all time favourite people) Justin Fletcher. There is also a video on the CD which tells the story in British Sign Language. This video doesn't feature Justin, but the lady signing is very enthusiastic and expressive and the illustrations from the storybook are shown in the background. I couldn't get the video to show in our DVD player but it worked on a computer. The video is also really handy for learning the signs that are pictured at the end of the book as you can see them being done for real rather than just from a still picture so it makes it far easier to learn how to sign those words yourself. Me and Miss T had great fun reading this. Thank you Panmacmillan for your kindness in sending us this book. It's available to buy from Panmacmillan here. Miss T had a special delivery arrive for her this week. And it was stunning. Perfect for cheering her up after all she's been through in recent months with her diagnosis of juvenile arthritis. I always find I'm short of time when it comes to blogging and so rarely get to write up about new brands we've discovered other than the brand reviews we are specifically asked to do. 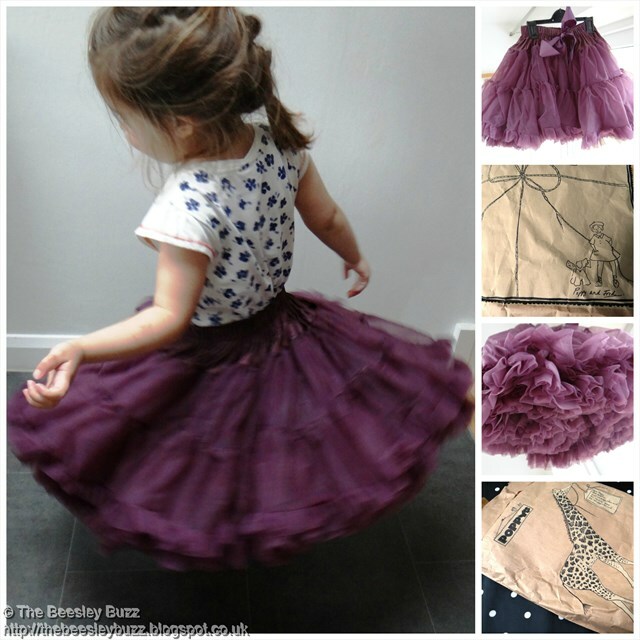 But this petticoat from Poppy England was SO gorgeous that I had to capture the moment on our blog. Here's Miss T modelling it. I ordered the large children's size (age 4-7) because she is a tall 3 year old and keeps outgrowing her clothes so quickly. Choosing the colour was tricky because it is available in so many pretty colours. We chose the gorgeous plum colour. And I couldn't pick out my favourite photo so I've included lots! And whilst looking on the Poppy England website, I have totally fallen in love with some of their ladies dresses. You can get matching grown-ups and children's dresses like the stylish Budgies collection. I've added the Iris Navy budgie to my birthday wishlist and Miss T would look stunning in the matching design. I think the Georgina Navy budgies would look adorable on her. UPDATE: Poppy England has undergone a couple of rebrandings since this post was written and you can read more about why here. They are now Palava.co (pronounced Palaver) and still make the most gorgeous dresses, skirts and clothing for children and grown-ups! A Splatoon kind of Birthday! J loved Splatoon so much he wanted his birthday cake in a Splatoon style...! It's J's birthday this week. He'll be 11. And on Saturday he had a couple of friends round for a gaming party. We'd only just received the download code a couple of days before that so we kept it a surprise for the day of the party. When we told our boys that Nintendo had sent us a copy of Splatoon for the WiiU to review, the squeals of delight could be heard down the street! We then watched J tell his friends as they arrived and I wish I caught their reaction on camera. It was awesome. J and his two friends had the biggest grins on their faces as they just kept repeating in amazement - 'Splatoon!''Splatoon''Splatoon!!!' Whilst jumping up and down. They soon wanted to get started. They had all heard about this fun new game and really wanted to drive straight in so, after they each ran through the tutorial, that is exactly what they did. In Splatoon you play as an Inkling - a person who can turn into a squid during the game. A unique style of game - part shooting, part strategy, part puzzle, totally complete frenzied fun. There is a range of game types to play. In each, you must play the part of a character carrying a weapon - the difference from any other game is that you fire ink (remember, you are part squid). In the two-player contest, you have to shoot to pop balloons, with the winner being the one that pops the most. Of course, covering your opponent in ink is also fun and slows their progress too. As this is the local multiplayer mode, the boys have spent quite a long time on it, battling each other and thrashing Daddy. The online multiplayer mode sees you teaming up with 3 other players, and taking on 4 opponents. You simply have to cover more of the ground in your team's colour than the opponent does in a set time. As you progress, you earn credits to upgrade weapons for future contests. Despite the other players being far better than Daddy, he still earned points based on his own personal progress, so it really is a fair battle even if you do not win the round. Then there are the missions, which see one player taking on a series of challenges in a story mode to try to rescue the missing ZapFish from the Octarians. Our J loved this, as he particularly likes any longer term challenges in games. The controls were quite easy to pick up, despite there being a lot to remember. Switching from the WiiU game pad to a handheld controller for the two player game was a bit more difficult, as it has no motion sensor, but the kids managed it faster than Daddy! All in all this is a fantastic fun game, and one I am sure we will keep coming back to. Do watch the video over on the Nintendo site as it really does give a flavour of the fast-action ink-blasting fun. As his friends were leaving at the end of the party, all we could hear was them saying things like 'awesome' and 'best day ever!' So I think they really liked it too. Now back to birthday planning for his actual big day. He's asked for two cakes - a big one for his mainstream class with the Splatoon theme and a smaller one for his ASD unit with the Tomadachi Life Apartments on it! Tomodachi is his other mega favourite game and you can read about that here. Disclosure: We were sent a download code for Splatoon as part of the Nintendo UK Family Blogger Network, for the purposes of this review. All opinions are our own. We usually like to get to grips with a new game ourselves when we review it but the boys have been totally hogging Harvest Moon:The Lost Valley since we got it so I've had to let J single handedly do the review. On Harvest Moon: The Lost Valley you can plant crops and flowers. You can build squares of land. There are Harvest Sprites and a Harvest Goddess. You have to help the Harvest Goddess gain enough power to stop the endless winter. As you progress through the game you meet more people that can help you. If you have enough money, you can buy barns, chicken coops, chickens and cows. When the animals are old enough they can become pregnant and have babies. You have to feed the animals, milk cows, brush them and let them out their homes to graze. You can clean up dirt patches on the floor inside their homes to get compost which you can use as fertiliser and you can also collect eggs from your chickens. You can choose if you want to sell the egg or put it in the incubator. If you put it in the incubator then it will hatch and there will be a chick inside. You get your first barn and cow for free but then you have to pay for animals and buildings. Also you can buy items for your house like a kitchen or some wallpaper. You can sell crops and flowers for more money. You can also create food using recipes to eat or to sell. You have five hearts at the top of the screen. When you do work your hearts go down. You can use food to boost your hearts back up. You can also cut down trees and fish in the river. You can sell trees and fish for more money. It is fair to say that both J and D love this game. They have spent hours developing their crops, tending their animals and venturing off to help the Harvest Goddess. 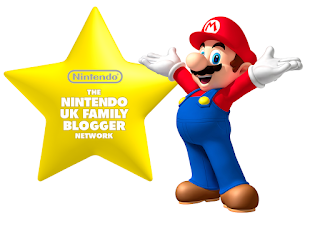 It has just been released by Nintendo a few days ago but as Nintendo Family Bloggers the boys have been putting it through its paces for a couple of weeks to really get to know the game well. Disclosure: We were sent a copy of this game as part of the Nintendo UK Family Blogger Network, to keep for the purposes of this review. All opinions are our own. Currys PC World have challenged bloggers to come up with their top 5 TV dads in time for Father's Day. You can choose any dad from any current or past TV show. That'll be a breeze, I thought. But when I set about thinking of which TV dads are truly amazing and inspirational, I was stumped. The more I thought about it, the more I realised that many of TV's sitcom dads and soap dads are rather pants. Either plain silly or just not the sort of person you'd aspire to have as your dad. Sure there are a few exceptions but by and large they are often there to be laughed at or play the fool. 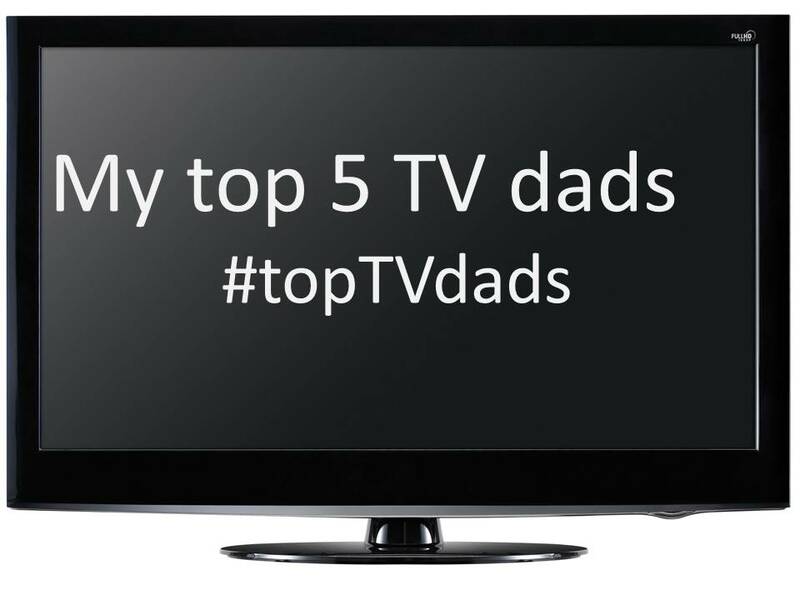 In recent years, the shows we enjoy on TV tend to be reality type shows rather than fictional and once I started to think of these amazing real life dads who also have brilliant TV shows, the task of picking my top 5 became a whole lot more interesting. I'm going to get the most controversial out of the way straight away. Before you stop reading right now at the mention of his name, I'd say please bear with me and let me explain... The dad that gets my number five slot seems to have changed and grown as a person since becoming a dad. He seems to have discovered that somewhere deep within him he does actually possess a heart and is capable of showing some emotion. 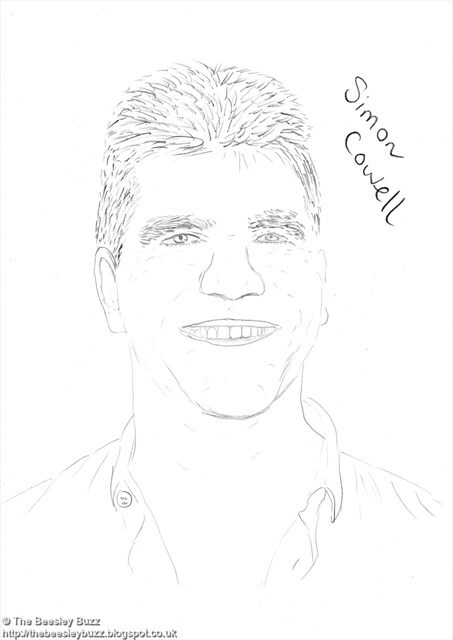 So top TV dad number 5 from TV shows X Factor and Britain's Got Talent, is the man we all love to hate, but let's give him a second chance now he's become dad to little Eric, it's ...Simon Cowell. In at number 4 is a TV dad who first hit our screens many years ago in what turned out to be a disaster of a TV/ social experiment on the Isle of Taransay. 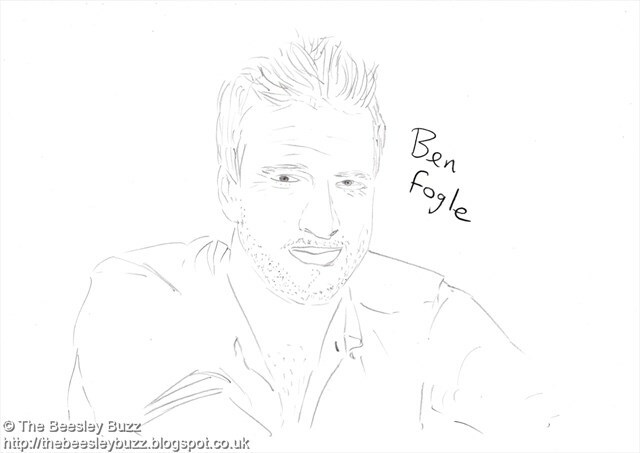 A much younger Ben Fogle, even in those days before he became a father seemed to have real fatherly wisdom. Whilst the other Taransay islanders bickered and fought, Ben worked hard to restore peace and harmony. In more recent programmes where we've seen him trek across the Antarctic and across the Sahara we've seen just how much his wisdom and diplomacy skills have grown since becoming a dad. Not to mention oodles of patience and heaven knows you need a LOT of patience as a parent. When we've watched him on 'New Lives in the Wild' he interacts brilliantly with the kids of these families living in such remote places. Many of the kids would not have come across other people as they are living in such extreme corners of the earth which are pretty much otherwise uninhabited and yet Ben has a way of making them feel at ease. His own family are never far from his thoughts either as he often talks about his wife and kids. 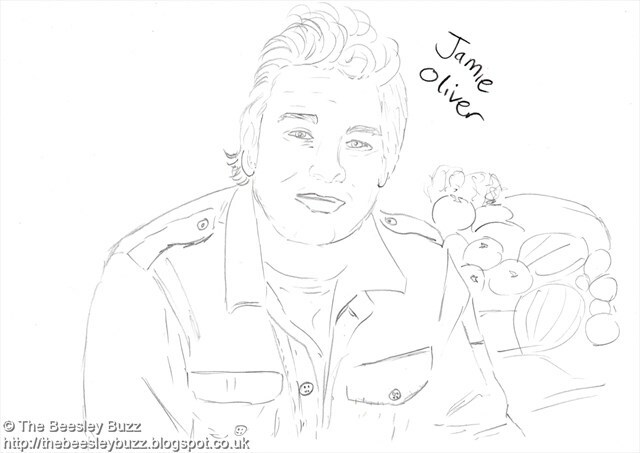 At number 3 we have the, brilliant for oh-so-many reasons, Jamie Oliver. I was first introduced to Jamie Oliver on TV in his younger pre-children days of The Naked Chef. I remember being horrified at hearing from my mum that she was watching a programme called Naked Chef as I had visions of some sort of x-rated adult show and yet it was actually the wholesome Jamie Oliver's first TV cookery show. The main reason he is in my top 5 TV dads is actually not to do with his cookery shows but a few of the other shows he did. Jamie's Dream School was just a genius idea and although it met some criticism about the kids involved remaining unappreciative, it showed that Jamie Oliver believed in them. He believed every kid has potential. An ethos that runs through much of his off-screen campaigning and charity work he does with the Fifteen Foundation he set up. Tackling America's obesity crisis in Food Revolution was another programme that showed his fatherly love and care for these kids and families who had never been shown the importance of healthy eating and looking after themselves. They were literally dying of obesity and problems arising from it and you could see Jamie's heart breaking at these desperate situations. He also faced huge battles in implementing change, not from the youngsters themselves but from the local authorities governing the schools and despite these confrontations and threats, he carried on with helping these kids break the cycle of bad eating which was making them morbidly obese. He's no doubt a great dad to his own kids but he's up here at number three for his fatherly love and care for others youngsters too. We're getting very close to number one and coming extremely close to clinching the top spot is someone who is used to living life to the extreme, Bear Grylls. 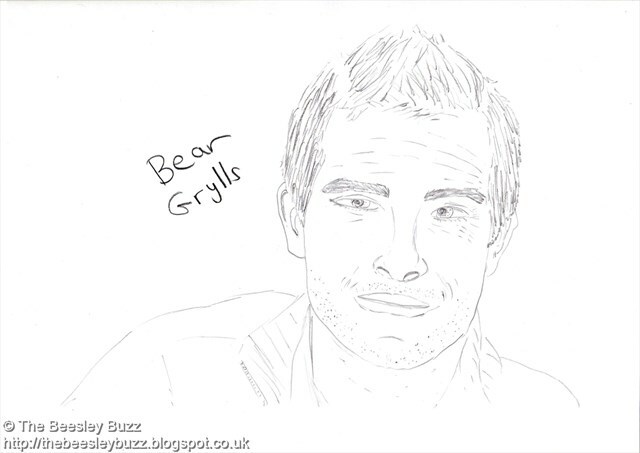 We have become rather addicted to his TV shows and absolutely love Bear Grylls' The Island. We also watched Mission Survive earlier in the year. The way he encourages and motivates others is inspirational. We can just imagine how great he is at doing the same with his own kids. His 'triumph over adversity' motto is a great one to be encouraged by. A little sneak peek into his own private life was when he got in trouble for installing a slide that went straight out to sea on his own island he lives on. Whilst their local council may have had health and safety fears about it, it made me think that he really should get the coolest dad award for doing something so mega cool for his kids. And now we've reached number one spot. We've been through from nasty to nice, from Simon Cowell to Ben Fogle. We've had a chef and an adventurer. So who will it be at number one? Despite all their virtues these real life TV dads weren't quite perfect enough for number 1 and so we've had to turn to fiction to find the perfect father. Nowadays families come in all shapes and sizes and on-screen families are no different. Even the most unlikely characters can qualify as a dad. 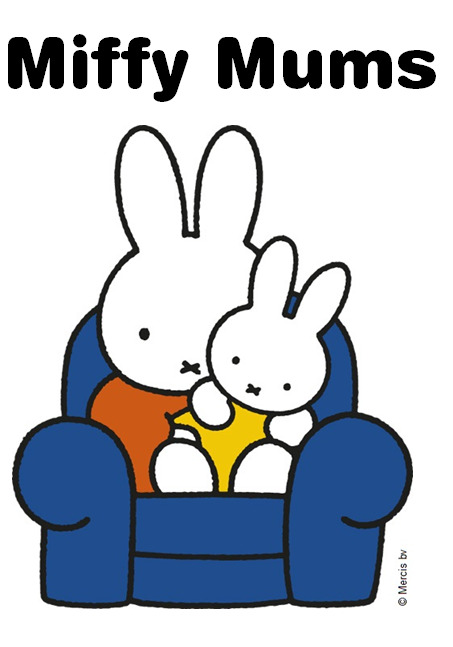 And so it is with Bing's dad, Flop. 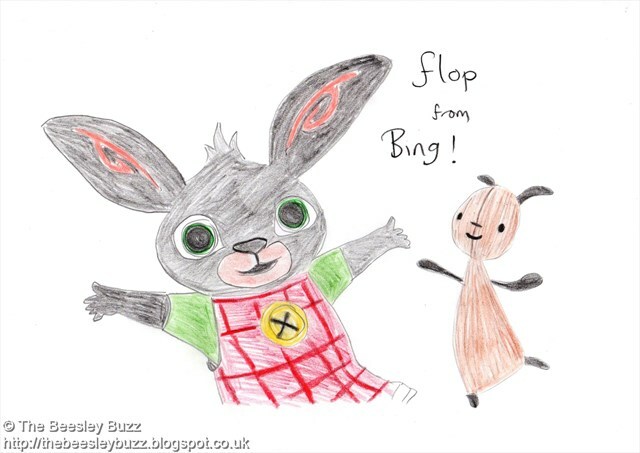 For anyone who hasn't seen this popular CBeebies cartoon, Bing is a rather oversized toddler bunny rabbit and Flop is, we can only assume, his dad. Flop is tiny by comparison and made from caramel coloured wool. But it's not his unusual looks that make Flop the best TV dad. It's actually his endless patience, knowing what to do in every possible situation, and never, ever, raising his voice or getting cross at Bing. Bing spills cereal all over the floor. Flop calmly vacuums it up. Bing steals a lollipop. Flop ensures it is returned to the shop and paid for. Bing breaks a toy crown whist fighting over it. Flop helps them make a new one. Bing gets locked in the store cupboard at the shop. Flop calmly finds him and lets him out. And so it goes on. Whatever challenges Bing throws at Flop, Flop isn't fazed. He takes it all in his stride. Never once getting annoyed. These are all things we can relate to as parents and I know my reaction to these scenarios would involve a whole lot of shouting and most probably a little swearing, and then a whole lot more shouting. And yet Flop manages it all in textbook perfect style making him look like some kind of SuperDad. Whilst we can all aspire to be a little more like Flop, perhaps less yelling at the kids, embracing every opportunity to help them learn, teaching them good morals and values, we've got to remember not to beat ourselves up about it if we don't quite manage to cheerfully smile as we vacuum the floor for the hundredth time after the kids have made yet another mess. After all, Flop is the stuff of fiction for a reason. As you may well ave gathered from our previous posts this week, we have been having a F.A.B. time with our Thunderbirds Are Go missions. 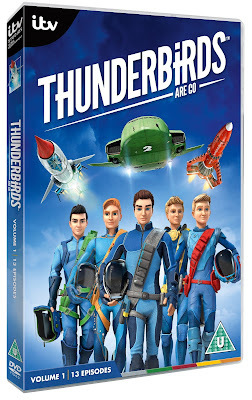 First we Unboxed our goodies and mission data stick to get started, then we became International Rescue Agents on the Thunderbirds.com website and today we're going to let you know what we think of the new series DVD. Personally I'm not quite old enough to remember the original Thunderbirds programmes of the 60s so we're not going to make any comparisons between original and new but we do thinks it's great that these truly legendary characters have been given a makeover and a new lease of life to excite a whole new generation with their International Rescue missions. Both our boys, aged 10 and 9 really got into this and as they'd already had their appetite whetted by seeing a couple of the episodes airing on citv recently, they were mesmerised watching the DVD. Miss T is still a little young to fully get it, but she really picked up on the excitement. We've had a lot of running about shouting 'to the rescue' from her. Although you may remember from our unboxing video that this little agent might need a bit of re-training to learn it's 'Thunderbirds Are Go' and not 'Thunderbirds Are Here' as she reps saying. She's so cute, we didn't have the heart to correct her. So here's what we thought of the DVD in our final Thunderbird Mission video for this week. The DVD is available to re-order right now from Amazon and iTunes and is released on 22nd June 2015. So what are you waiting for...5...4...3...2...1. Thank you Thunderbirds for sending us the DVD to review and getting us involved in this special mission. France, 1952. Adeline, a mute living in a refuge. The Sisters trying everything they can to help understand the history of this woman and unlock the secrets she holds. France, 1940s. Sebastien, a young Jewish banker. His father understands the growing risks to his family in wartime France. Sebastien, initially less sure, falls in love with Isabelle from a nearby village. Paris, 1940s. Tristan, a nine-year-old boy whose family flee the dangers in Paris and settle in rural France. Through the three interwoven stories of Adeline, Sebastien and Tristan we see the unfolding of a period of history, a shared tale, a story that should not be forgotten. The gradual build-up is beautifully written, giving descriptions so clear that it is easy to become immersed in the novel. The final few chapters give the full harrowing account of what happened. Told from different perspectives, it gives details of something truly horrific, shocking and totally unexpected. This is a must-read, but be prepared to shed a tear or two at the end. Cesca Major's is a sensitive telling and a fitting memorial to the events depicted. I would strongly advise against reading the historical notes at the end before reading the book and don't look up details of the story beforehand as the sudden and unexpected final chapters, that contrast so strongly to the build up, are shockingly raw and deserve to remain so. 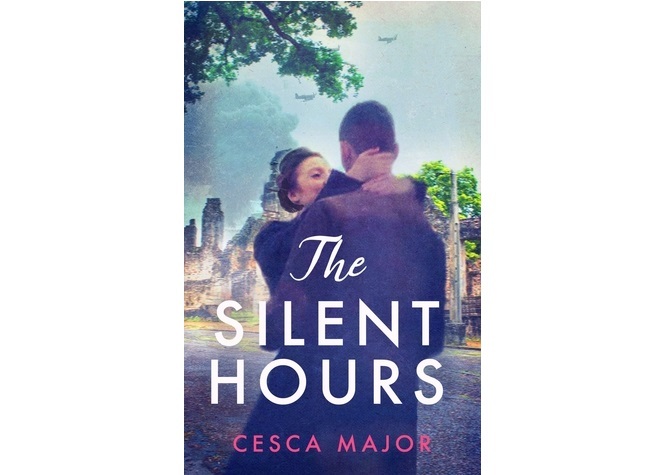 The Silent Hours, by Cesca Major, is published by Corvus Books. Disclosure: We were sent this book as part of the BritMums Book Club. All opinions are our own. You can read other reviews here. No matter how young or old you are, everyone seems to know something about the legendary Thunderbirds. Originally a hit TV series in the 1960s, the Thunderbirds are back with a thrilling new series. The kids had caught a couple of the all-new episodes on citv recently so couldn't believe their luck when they were asked to take a look at the Thunderbirds.com website and join in the fun there. You can sign up as a recruit, take part in International Rescue training missions, earn badges and rewards and work your way through the ranks. In this video, 9 year old D (or should I say 'FearlessSpectrum50' which is his recruit ID) is here to tell you all about it. It's great fun creating your Recruit ID name from the various options. J's recruit ID is StealthMotorbike05. And Richard has chosen 'IsotopicFusion03'. Cool names huh!? We are particularly impressed with the parental controls that can be set up when you register a parent account. You can find out everything there is to know about Thunderbirds! There are a few things that have been kept extra secret for added fun. For these areas, you can download a free field app onto mobile devices to find out the extra info. This isn't essential as you can still play the missions without it. The kids have each done a couple of missions each and have really enjoyed them even though they found them quite tough at times. They are very keen to get back on the website for more missions soon! So if you feel up to the challenge (and if you think you can create even cooler recruit ID names, then log onto Thunderbirds.com and get started). Join us back here on the blog tomorrow for a review of the new Thunderbirds Are Go DVD and if you missed our unboxing video yesterday, you can catch that here. The DVD can also be preordered on Amazon or iTunes in advance of the release date of 22nd June. We are SO excited to have been asked to be 'Thunderbirds Are Go' bloggers this week in the run up to the release of the DVD of the new Thunderbirds Are Go series on 22nd June. 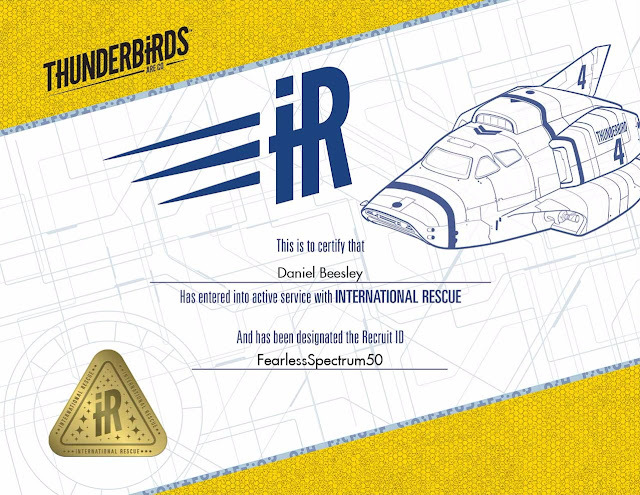 We have been sent two missions to complete by International Rescue and you can see them on our blog over the next couple of days. Thank you International Rescue for sending us these goodies. We look forward to getting started on our missions soon. 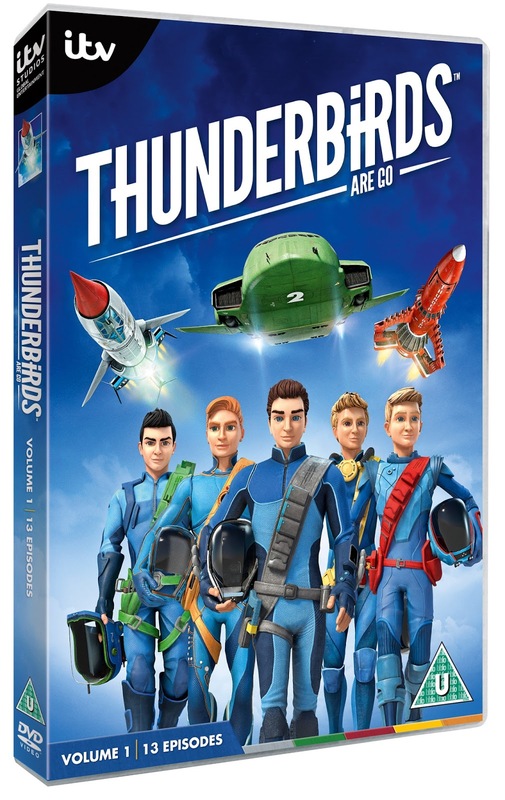 If you can't wait to find out more, you can find the Thunderbirds.com website here and the DVD can be preordered on Amazon or iTunes in advance of the release date of 22nd June. You may remember a while back we created a recipe using Canderel, our Heaven Scent Polenta cake. Well Canderel loved the recipe and so we got to have a special Q&A session with renowned nutritionist and writer Angela Dowden. My 9 year old son struggles with getting grumpy when he's hungry. We try a low GI diet with him but it is still a struggle when hunger pangs suddenly hit. Any tips for ideal snacks for him or alternative ways of keeping blood sugar levels stable? Angela: It sounds like you’re doing what you can. Kids need snacks in a way adults don’t so the key thing is always to make sure that you have some fairly substantial snacks to hand, keeping the “main” meals modest so these can easily be accommodated in the overall diet. Dried fruit has a relatively low GI and teamed with cubes of cheese or some nuts makes a great snack. Milky drinks are perfect too. I wouldn’t obsess about GI for a healthy active youngster and things like malt loaf, scones, and hummus and of course veg nibbles (peppers, cucumber) are great too. I always feel the need for something sweet after a meal. Any healthy options other than fruit that would really help with a sweet tooth? Angela: If you are going to have something sweet, after your main meal is the best time as the sugar is less likely to cause unhealthy fluctuations in sugar and insulin like it can on an empty stomach. So go for then (in moderation) it if you want to! Otherwise you can sweeten your fruit (berries for example) with Canderel to get a wee bit more of a sweet kick without the health downsides, or make your own sweet bakes or puds with sweetener instead of sugar. Another suggestion is a (small!) cream cake like a chocolate éclair – it’s often lower in both sugar and calories than, say, cheesecake or pie. Angela: In honesty, not really and though there may be some that work, there are many different variations and it’s not really known what really might work for which condition. That said Actimel and Yakult should both be safe in three year olds and I would stick to mainstream one such as these for someone so young unless she has specific advice from a specialist. A friend of mine has a vegetarian daughter. She asks about safe vitamins and supplements for children. Her daughter is a strict vegetarian so won't eat fish oils. She isn't a fussy eater but would love to know safe brain food for children that are veggie friendly. People tend to steer clear of advice for children and suggestions of spirulina doesn't crack it for kids especially asd children. Angela: I believe there are algae based DHA supplement that would be worth looking into that will provide her with good amounts of the “brain” omega-3 DHA and are acceptable to most vegans. If she is including dairy and eggs then she may not need to worry about iodine and vitamin B12, but if she is not then these also should be considered and there are acceptable vegetarian forms (ask at a health food shop). Milk alternatives given to children must be fortified with calcium. To get adequate vitamin D she will need 15 minutes in sunlight before sunscreen is applied. Iron can be an issue, but nuts, green veg and tofu supply good amounts. I'd love to cut down more on meat, especially red meat but find I don't get on with pulses e.g. I think I may be intolerant to lentils and some beans as have been sick several occasions after eating them. Other good alternatives? Angela: Some people do have an issue with pulses. Other options include tofu, quorn, textured vegetables protein and of course good old eggs if you prefer something less processed. Nuts are a very underrated source of protein too. My niece has acid reflux. Any dietary advice to help? Angela: In a nutshell, eat little and often, avoid too much fat (a common guide is 45 g per day for men and 30 g for women. Coffee (not just caffeinated) and alcohol should be moderated. Some people find particular food sensitivities make reflux worse, e.g. lettuce, onions, garlic and capsicum. I would urge your niece to keep a food diary to see what seems to affect symptoms. It’s worth noting that some sufferers may have a problem with gluten. A specialist dietitian should be able to help. I'd love to know what you would consider to be the best type of oil to cook with? I switched from olive oil to rapeseed oil years ago for cooking but recently heard groundnut oil is good too. Any benefits of one over the other? Angela: I personally use rapeseed a lot for everyday (a good monounsaturated and heat stable oil), but I also mix things around with sunflower (vitamin E rich) and olive too. Groundnut is also a “good” oil, but I really do advise mixing it up a bit in general. I love the taste of rice milk especially brown rice milk. I'm not intolerant to dairy so can also have normal milk. Pros and cons of each? We're really enjoying energy balls (e.g. bounce and own homemade ones too) and also seed bars like 9bar. Although they are packed with goodness, they also seem quite calorific. Is it worth the calories? I've recently been reading about sprouted flours. What do you think about these? Just a fad or something good in it. Angela: I’d say watch this space. I haven't seen much data on how they compare nutritionally with other flours, but I understand that they are higher in some vitamins and minerals and maybe better digested too. Forms of sprouted flour have been popular in Spain for a long time, so they are hardly new. Maybe they will become mainstream here soon, a bit like quinoa is now, despite seeming very exotic a few years ago. And finally, if you could give only one really mega top tip regarding nutrition and healthy eating - what would it be? Angela: Fill half your plate with veg or fruit at every meal. Thank you Angela. We've found these ideas and tips really helpful. I know I'll be filling my plate with a lot more fruit and veg! 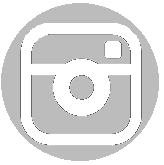 You can find out more about Angela here on her website and more about healthy eating with Canderel here on their Health and Wellbeing section of their website. Next week happens to be Rheumatoid Arthritis Awareness week (15th-21st June) and you might think that after our light-hearted post about celebrating Iced Tea Day, that I thought it would be appropriate to also highlight something more serious and important. But that's not the case - it's simply that last night and today we are just fed up. Fed up of living with arthritis. Both me and Miss T.
I know I'm going to hover over that publish button deciding whether to hit publish or delete at the end of the post as my blog is usually my 'happy place' to escape to, but right now I need to rant. For 2 days I've had to send D walking to school on his own. I hate doing it as the traffic is so bad around the school in the morning and although he's a sensible lad, I still worry. He hates going alone but I've have no choice. My back feels on the verge of a flare up and I know if I push Miss T in her buggy, it will trigger the flare up and I'll be likely to be out of action solidly for a week or two. I can't let that happen. The benefit of having lived with arthritis for 27 years is that I can sense this type of flare up coming. I think of 3 main types of pain with my arthritis - A general stiffness that can happen out of the blue and can be longer lasting (for that the GOPO rosehip supplement has really helped a lot), the second is a constant pain in my lower back when I've over done things - can last from a day to a week - my arcoxia tablets seem to help with that type of pain. I think technically that is more of a lower back pain rather than specifically arthritis but it gets triggered because of my arthritis because of the way my hip can't move properly and how my back compensates for that. The third type is what I feel is happening now. Sharp pains that come with any 'wrong' move. If I make a wrong move or do something that could fully trigger it, like pushing T in her buggy, then the pain becomes solid until it recovers. Can take anything from 3-4 days up to a month or so. The trouble is that Miss T cannot walk far without her buggy because of her arthritis. So we are left in this kind of catch 22 situation and I haven't a clue how to handle it. D's school suggested asking friends to help out but I hate having to be reliant on others. My next worry for today is Miss T's temperature went up last night and with the Methotrexate she is on that can be very dangerous for her. 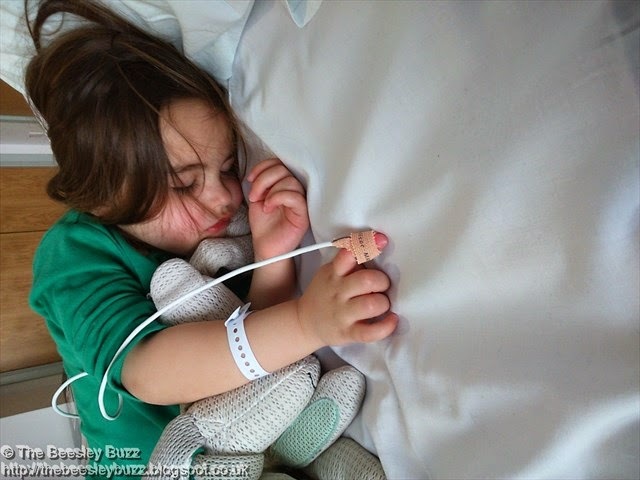 So we've been monitoring her closely and the nurse advised to get her checked urgently by the GP this morning. At the moment she's doing ok as we can get her temperature down. But I can't help worrying. She's been on Methotrexate (MTX) for 7 weeks now so I am truly glad this is the first temperature she's had during that time but my fear is that it is the first of many. She'll be on MTX for at least the next couple of years and I dread to think what things will be like over the winter months when bugs are rife. Prayers for Miss T appreciated. And rant over. There seems to be a 'day' for everything...from World Book Day to Grandparents Day to some brilliant awareness raising days for various medical conditions. Well here's a more unusual one for you. Iced tea day. Tomorrow (10th June) is Iced Tea Day. Yes I know it's not quite as unsual as Donald Duck day (which is today apparently) and Ball Point Pen day which shares its day with Iced Tea Day tomorrow, but it still seems pretty strange to me to have a day dedicated to Iced Tea. Yet I didn't want to miss this opportunity to relax in the garden with a cup of Iced Tea. I've recently discovered that I enjoy Green Tea and yet I'd never thought of having it as Iced Tea. Inspired by Tetley's range of Green Tea and flavoured Green Tea's, I made my own Iced Tea using Green Tea. With oodles of Ice, some slices of lime and some fresh mint, it made a really refreshing drink. As well as Original Tetley Green Tea, Tetley Green Tea is also available as Tetley’s Green Tea & Mint, Green Tea & Mango and Green Tea & Passionfruit. Or for an even bigger health boost, there's Tetley’s Super Green Tea Immune (with added vitamin C) or Super Green Tea Boost (with added vitamin B6) – available in Tropical, Lemon & Honey, Berry Burst and Lime flavours. So will you be celebrating Iced Tea day tomorrow? June is Lurpak's Freestyle Food month. I know that we can certainly relate to the boredom that comes with tucking into the same sandwiches for lunch day in day out so it really was time to shake things up a little. So here's our freestyle food creation....A green superfood wrap that can be eaten either 'open sandwich' style or wrapped up and taken on the go. We've tried to be health conscious too using Lurpak spreadable lighter and lots of healthy ingredients to give a much needed boost at lunchtime. This amazing tasting wrap is a brown square wrap spread with Lurpak Spreadable Lighter. Then some super greens - rocket, spinach and watercress along with some pea shoots on top. Sugar snaps can be added either par boiled or raw as I love munching them crunchy and fresh when they're in season. Sprouted quinoa and avocado add to the superfood appeal, followed by a little goats cheese crumbled on top and the real freestyle surprise, blueberries scattered on top. This can be drizzled with a homemade wholegrain mustard and balsamic vinegar dressing (combine wholegrain mustard with olive oil and balsamic vinegar in a jam jar with some seasoning and shake well). Or eaten without a dressing if you prefer. The blueberries really do give it a tasty surprise as they burst open as you eat them with the wrap. I hope we've inspired you to go freestyle with your food this June. 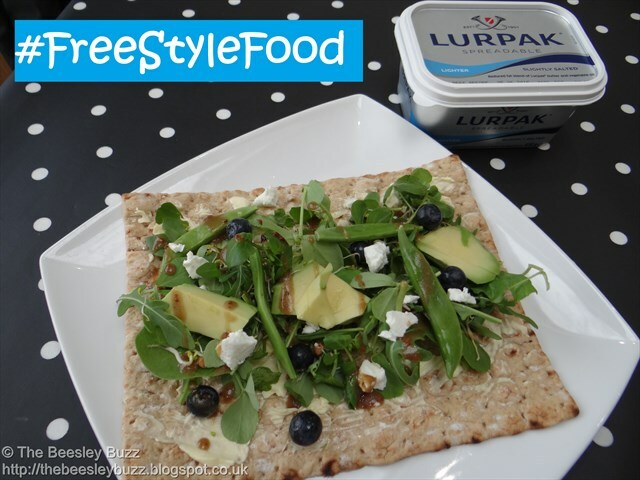 There is a fab competition where you can win a Lurpak hamper by sharing your photos of #FreestyleFood on social media. Pop over and take a look at the full details here. Good Luck! 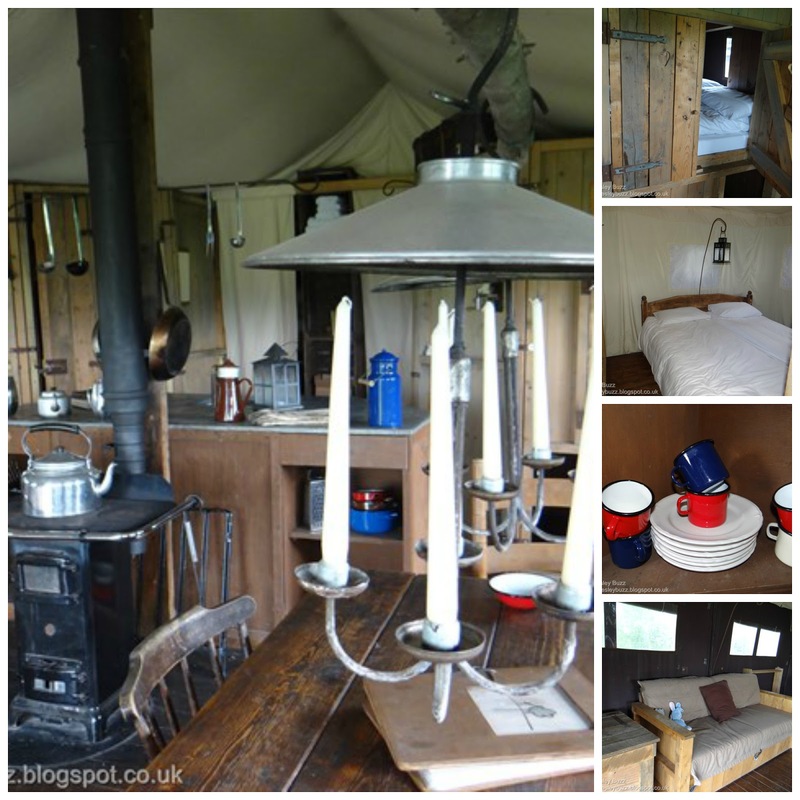 Our first taste of Glamping! We've just had the most amazing few days away at Manor Farm, one of the locations you can escape to with Featherdown Farms. And 'escape' really is the right word for it as with no electricity we were forced to go without our phones, emails and gadgets and here's the really good bit....none of us even missed them! I wrote up a diary using pen and paper whilst we were there. The kids found it hilarious that I was still finding a way to 'blog' but without a computer. You can see our diary here but as it is a long post, this post is supposed to be a shorter 'summary' version. We had a 'frills tent with hot tub' and as this is not a review post, you can look up any details yourself over at Featherdown Farms. If you're expecting luxury hotel style surrounings, then glamping is not for you because at the end of the day it's on a farm with dust, cobwebs and even a few spiders. You have to get used to only having cold running water (although we did have a nice gas powered outdoor shower which was lovely and warm) and it takes ages to boil water for a cuppa. There is a drinks machine in the honesty shop if you get desperate for a morning coffee fix but we loved the idea of slowing down the pace of life so stuck to boiling our own water on the wood burning stove. We'd been warned by Siobhan at Everyone else is normal that it can get very cold at night so we had taken dressing gowns and hot water bottles. As the tent sleeps 6 people, we even doubled up the spare duvets on us as I really feel the cold. We spent our days watching the kids play outdoors with sticks. We built campfires. We sat in the hammock and watched the sunset. We spent our evenings toasting marshmallows on the open fire. We cooked outdoors (would highly recommend the luxury BBQ pack and the Stew pot). The boys joined in with Club Morgan. We had an amazing farm tour. And we were made to feel so welcome and looked after. Will and Anna checked on us at some point everyday to make sure we were ok. Their kids are amazing and friendly too. If you are looking for rustic, romantic, idyllic surroundings where you really can get away from it all - This place is simply perfect!